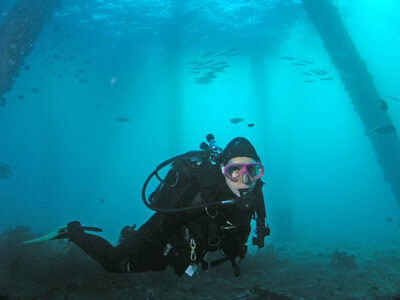 Michael McFadyen's Scuba Diving - Gravel Loader The Bass Point gravel loader is one of a number of dive sites in the Shellharbour area which are regularly dived by Sydney divers as well as locals. Located only 105 kilometres south of the centre of Sydney (no more than one and a half hours drive) on the southern edge of Wollongong, Shellharbour is very popular with divers, especially those from the southern and western suburbs of Sydney. 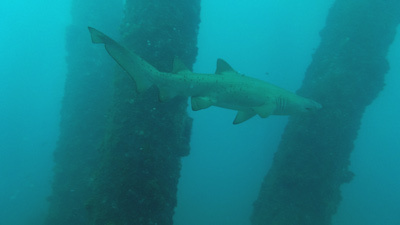 The most popular dive sites are found in or off the Bass Point Reserve which is just to the south of Shellharbour township. They include Bushrangers Bay, The Arch, Hump One, The Gutter and Beaky Bay as well as the remains of the ships SS Cities Service Boston, Alexander Berry and Our Own. One of the great things about diving at Bass Point is the fact that the reserve is an excellent place to stay for a whole day, doing two or even three dives with a barbecue or picnic lunch on the grassy lawns. Note that barbecues are no longer provided but there are picnic tables. However, note that since December 2001 the local council has been closing Bass Point whenever there is a Total Fire Ban. Check with the council to save a wasted trip. You also used to be able to dive the Gravel Loader as the road was not closed till after the loader. This is different now (after August 2005) as the gate has been moved right to the gravel loader and the access on the western side of the loader before the new gate has been blocked by huge granite boulders. What a bunch of burkes!! The council really has no idea of the needs of the public nor cares! Total twits! From Sydney, you travel to Shellharbour by following the southern tollway south from Waterfall, past the Wollongong and Port Kembla exits to its very end at Albion Park. 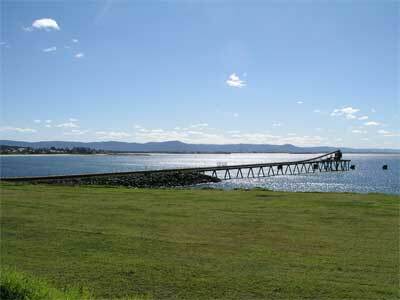 Continue along the Princes Highway for a couple of kilometres until you reach Oak Flats. Go past the new flyover and turn left at the top of the first hill and cross the railway line. At the top of the hill you can see Bass Point and the gravel loader in the distance. Follow the signs to Shellharbour. Eventually you will reach the huge Shellharbour Workers Club and the road takes you into the town's main street. Prominent signs lead you to Bass Point Reserve. The area's two dive shops are located in the main street. The first at the top of the street and the second a bit further down, both on the right. I have used both for airfills and dives, and both are recommended. You will see the gravel loader as you approach the reserve. Just past the loader is the entrance to an old boat ramp. This is the best place to park, although you used to be able to also park on the other side of the loader. Now, if the gate is shut, you will have to park outside and have a much longer walk to the water. This is possible but in hot weather (like when there may be a total fire ban), you may not want to do this. For night dives, this is the only way to do the dive now. The gravel loader is a relatively shallow dive that is excellent in southerly winds and seas. In even poor weather, it is generally possible to dive this site as it is totally protected from southerly winds and seas. As such, the loader can be dived virtually all the time. It makes an excellent night dive. 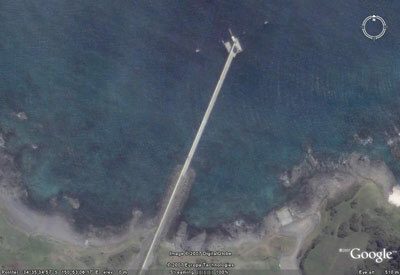 The gravel loader itself extends about 150 metres out from the shore. I believe that it is still in use, although I have never seen it working or a ship moored and being loaded, despite dozens of trips to Shellharbour. As indicated above, you can start the dive from both sides of the loader. 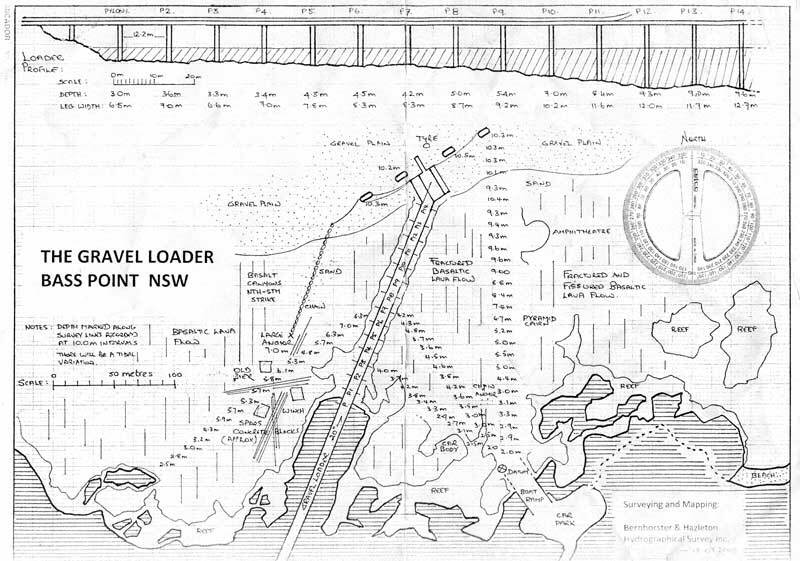 The better entry and exit point is from the right side of the loader (that is, the eastern side) near the boat ramp, mainly because it has better parking and a better area for gearing up. In fact, after gearing up on the grassed area, enter the water from the boat ramp and snorkel 30 metres out towards the middle of the loader. Take a bearing on the middle of the loader and, dropping to the bottom, swim on this bearing. The bottom for nearly the whole dive is composed of small a continous rock shelf. After a short distance you will cross over a large anchor chain. Follow it to the right and you will find the anchor itself. Return to the same bearing until you reach the loader. From the western side, enter the water right against the loader's rock wall and drop straight to the bottom. The depth is two to three metres. From here, swim north-west for a short distance and you will drop to four to five metres. Turn right and follow the shallow gutter. All around here you will see lots of metal. This appears to be parts of an old gravel loader, with steel reinforced concrete pylons, steel girders and other twisted bits of metal all over the place. There is even a plaque to a diver here. After noting prominent features where you meet the loader (depth, discarded items etc) turn to the right (left if coming from western side) and head out to the loader's end. Examine the pylons along the way for macro life as well as the bottom around them. When you reach the end (you can tell you are nearing the end when the pylons become more numerous and not as uniform in placement), circle out to the right and back to the left, on a radius of about 40 to 50 metres. You will encounter some more pylons as well as some huge truck tyres (look inside them) and piles of gravel that has missed the ships' holds. 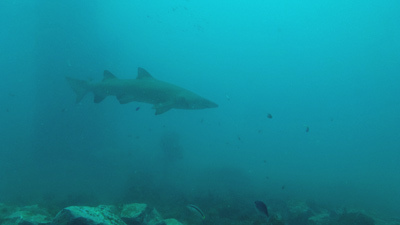 In early to mid-December 2016, a number of grey nurse sharks started been seen here appear to have set up home, perhaps permanently. As of late January 2017 they are still there. The sharks mostly hang around the very end of the loader. 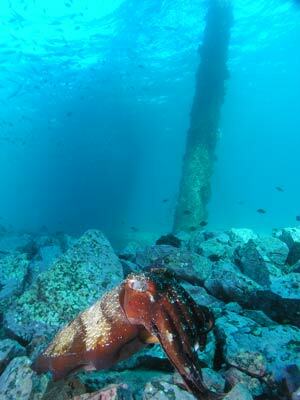 To see them, swim out till you nearly reach the end and stop next to one of the pylons or the old cut off pylons. Wait here and look all around. Hopefully within a few minutes you should see the sharks slowly cruising by. On my only dive here since they sharks moved in, we had a total of at least seven sharks. Like Magic Point in Sydney, it seems that this is a nursery, as all the sharks were females or juvenile males. We did not see any really big females, but three were quite large. Once you get back to the loader, return to the shore along the opposite side of the loader to that which you went out on (this way you see more) and when you reach the point where you joined the loader, go on the opposite bearing back to the boat ramp (or the western side). It is a simple matter of crawling up onto the ramp to exit the water. On this dive you will not usually see big fish, although the usual red morwongs, striped seapike, various leatherjackets and bream are often seen. I have even seen kingfish, tuna and a large silver drummer on this dive. 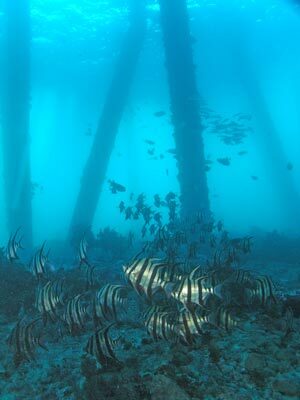 There are also lots of bream, yellowtail, one-spot pullers and leatherjackets (black reef and moasic). The big attraction of this dive is the smaller fishlife and macro-life. Cuttlefish (giant and small), squid, moray eel (although I saw none on two dives in 2002), eastern hulafish, pygmy leatherjacket and old wife are commonly sighted. If you are lucky can sometimes see common sea horses on the piles as well as numerous species of nudibranches on the sea-floor. I have also seen pipefish, tiny firefish, many different species of butterflyfish, juvenile surgeonfish and even perhaps a juvenile triggerfish (it was a species I had never seen before) here. If you are planning to do this dive as part of a double, it is better done as the second dive after the deeper Bushrangers Bay or The Gutter. 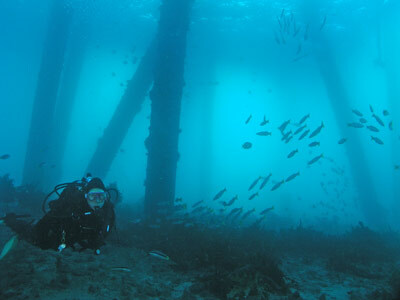 Maximum depth on this dive is 12 metres and a minimum of 40 minutes is required to properly explore the site. You can easily spend 60+ minutes here. 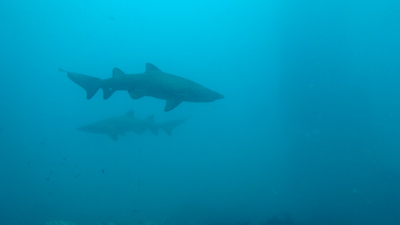 A very good and easy dive and now an amazing dive considering you can dive with grey nurse sharks!